Pages are an essential component of your website they'll display all of your content and provide structure and organization to your website. On a Blockity builder there is no limit to the number of pages you can have. Most of the templates comes with 3-4 pages set up already, however it is easy enough to add more. To add more pages to your website click page menu in the top left corner of the editor and click add a new page. The added page will automatically be your subpage. This will also generate a list and your new subpage will appear at the bottom. 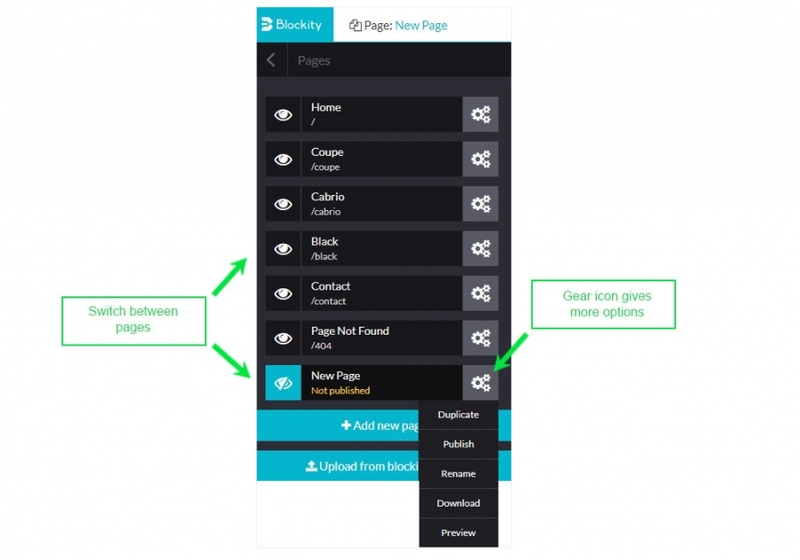 Simply switch between pages by clicking Eye Icon. From there, you can make changes to the content for the page you've selected. Click the Gear Icon to access additional options for the page on your website. 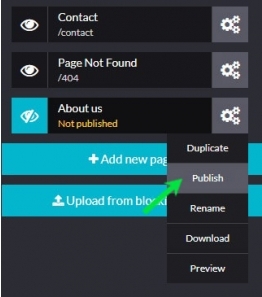 To make a copy of your page, simply click Duplicate. A new copy will appear at the bottom of the list. Rename the page by entering the new name in the info field. This is the phrase that displays in the tab at the top of your web browser when the page loads. Download will help you transferring page between different projects or accounts. Preview gonna quickly show you how your site will look like online. click Publish and put your page in the Online mode. That gives you an ultimate link which can be copied and used in others areas of your site. Remember - after you've completed making changes with your pages, make sure you also click on the save icon at the top right side of the editor. set your page as a Home Page by clicking on page link and use / only.